Lord Shiva requested Siddha Thirumular (also known as Sundarar, one of 63 saivite saints) who was helping God Shiva, to bring the poison to Him. Thirumular immediately brought the poison in a shape of a ball about the size of a Navakani and handed over to God Shiva. 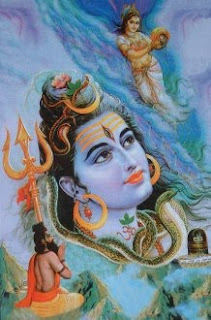 God Shiva then swallowed this poison which stuck to His throat blue in colour. Pradosham literally means the removal of sins ( Pra - Removal , Dosham - Sin). Pradosham is a specific window of time that occurs during the day. The energy during this time makes it easier to dissolve and release karma. Stories, prayers and rituals have been built around this time to help us better work with and understand the significance of these karma busting energies. There are different energy levels to Pradosham depending on which day of the month that it occurs. Each energy level indicates how much karma may be released at that time. Pradosham are a gift from the Universe to help speed our evolution and make our lives easier and happier. The Saturday pradosham is a very powerful pradosham, called the great pradosham or Maha pradosham especially if it fall during Waning Moon (Dark Moon period) as the first pradosham observed in ancient times is said to have been on a Saturday. Monday Pradoshams are also special because Mondays are most fit for Lord Shiva and it is the day ruled by His consort goddess Parvathi. - All Pradoshams occur between 1-1/2 hours before and right up until the moment of sunset in the time zone where you are physically. The smaller energy level Pradoshams occur every day during this time. - The middle energy level Pradoshams occur twice each month - on the 13th moon day after the New Moon and after the Full Moon. To determine on which days these Pradosham occur, begin your count on the actual New Moon or Full Moon day and count that day as "1". Continue the count until you reach "13". If you are counting from the Full Moon, Pradosham will normally occur two days before the next New Moon, and if you are counting from the New Moon Pradosham will normally occur two days before the next Full Moon. -The larger energy level Pradosham occurs when one of the 13th moon days occurs on a Saturday. The planet Saturn is considered the Lord of Karma who delivers many of life's tougher lessons to help us refine and evolve their souls. On a Saturday Pradosham it is believed that Lord Shiva has more influence over Saturn and can cause Saturn to loosen or release entirely some of the karmic bonds that limit us. Be in a meditative mode during the pradosham time and chant the "Thiru Neela Kantam" mantra by focusing your mind in throat region. If can try to visualize blue colour while you chant this powerful mantra with focusing around your throat region. The purpose of our human life is God realization. But Siddhas tell you that you can get to your life purpose only when your karma has been wiped clean, and the time is ripe for grace to flow to you. When that happens an intense flowering happens, and both the material and spiritual worlds open up for you. You have a choice then on the abundance that you are presented with. Whether you take the spiritual or material route, one thing is certain: you have to completely eliminate your karma to even to get there. Pradosham rituals give a great opportunity to build a road to prosperity and true happiness. On the 13th Moon Pradosham days, special poojas are offered to Lord Shiva who eliminates your karma and helps to bring light into your life. Nandi or the divine bull has a special place in Lord Shiva`s heart. Nandi is the privileged one who carries flowers to Mt. Kailash, the abode of Lord Shiva. Nandi is not a mere bull but a divine Sage who has guided endless number of Rishis. Even now when one prays with devotion to Nandi, you can see miraculous results happening. Nandi is the one who carried the poisons from Paarkadal to Kailas hill and later Thirumular change the poison in a shape of a ball about Navakanni and handed over to Lord Shiva to swallowed. The esoteric benefits of Pradosham are outlined in part of a wonderful story of when the angels and demons in Ancient times joined together to try and get an elixir of immortality. They used a magical snake that volunteered to serve as a rope to churn a magical mountain in a magical ocean of milk. The angels pulled from the snake's tail and demons pulled from the snake's head. They worked very hard and were rewarded with many gifts that emerged from the ocean, including Goddess Lakshmi, who is the Hindu equivalent of Venus. Eventually the elixir emerged. However, fate turned the moment of victory into a terrible disaster. The snake was in so much pain from the constant pulling that it vomited poison just as the elixir emerged. The elixir and the entire area started burning from the poison. No one was able to stop the destruction so the angels and demons prayed for help. The story continues that Lord Shiva heard their prayers, gathered up the poison with and swallowed it, saving the elixir along with everyone and everything. By goddess Parvathi command, the poison froze in the Lords throat, painting it blue and becoming an embellishment, gave Him the name Neelakantan. [It is also a common practice for womanhood to worship Goddess Parvathi for long life of Husbands as She is having Maangalya Baagyam and could turn the poison into nectar]. The actual Pradosham time in Malaysia and Singapore is from 5.00pm to 7 pm but unfortunately most of the temple mistakenly observing from 4.30 pm to 6 pm just by simply following temples in India. In India the Sun set time is at 6.00pm but in Malaysia and Singapore the Sun set time is at 6.30pm. Pradosham occur between 1-1/2 hours before and right up until the moment of sunset. Enlighten your local temple head or priest by giving this article and start to observe the ritual for Pradosham at the right time. Remember, what you do is important but when you do it is just important. The efficacy of spiritual practices can be increased greatly by timing it according to Siddha injunctions.